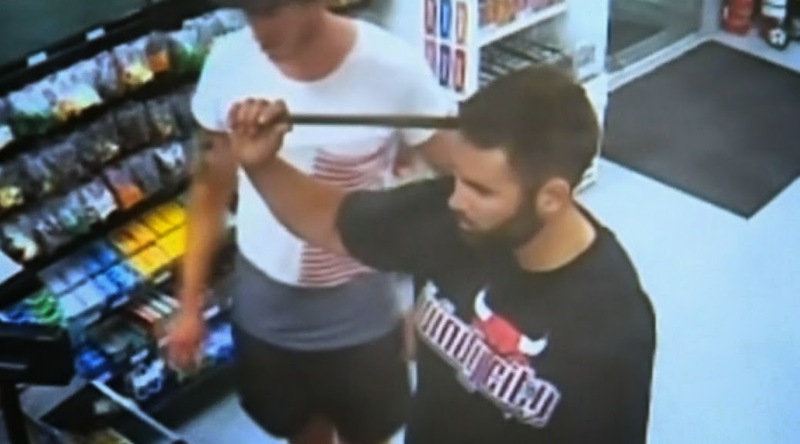 A New Zealand man drove himself to help after an attacker embedded a metal rod in to his head. The 23-year-old man was caught on CCTV walking into Caltex petrol station in Katikati, south of New Zealand’s capital Auckland, after he was allegedly attacked roughly four streets away. Police officers say that the victim was punched in the head and then hit with a steel rod, which embedded itself in his temple. In the CCTV footage, obtained by New Zealand’s 3News, the man can be seen walking into the petrol station holding onto the rod protruding from his head. Witnesses initially refused to believe what they were seeing, thinking it was a prank. "He just walked in with the rod in his head and I was just like, 'Is that a drum stick in your head?'" Witness Dylan Shea said, adding that the man responded: "'Nah, it's a rod.'" Petrol station owner Lester Gray told 3News: “It looked like a Halloween stunt where people wear those Halloween costumes over their heads, but it was pretty real when he turned around and blood was coming down the side of his head." Mr Gray said he was amazed at how calm the man, who told him he knew some first-aid, appeared to be and said he even asked staff to phone for police – not an ambulance. "I don't think he realised he was so hurt," said Mr Gray. The victim has now had the steel tyre iron removed from his head and is reportedly in a serious but stable condition in a local hospital. The police investigation into the attack is continuing.